Although he was born and raised on a farm in Missouri, Penney had strong connections to Wyoming. He married his first wife, Berta, during Cheyenne Frontier Days in 1900. He lived in Evanston and then in Kemmerer, where he opened his first store in 1902. He left Wyoming for New York in 1907, but frequently returned to the state from 1933-1962 to visit his Wyoming stores and friends. In 1945, he received an honorary doctoral degree from UW. Penney traveled to the Cowboy State for the last time in 1962 at the age of 87, when he accepted a lifetime achievement award from the Wyoming Council of Retail Merchants. 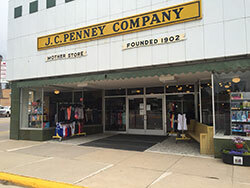 “Despite his stature as a national businessman, Penney’s last day in Wyoming was humbly spent waiting on customers at the J.C. Penney store in downtown Casper,” Kruger says. A benevolent and religious man, Penney embodied the Golden Rule and instilled in each store the philosophy of mutual respect among customers, employees, suppliers, competitors and communities. Despite his company’s growing success, he didn’t lose sight of his agrarian roots. In fact, he developed and administered numerous agricultural projects while overseeing his company as chairman of the board. One of his interests was to breed a higher quality of cattle, working specifically with Guernsey dairy cattle, and Angus and Hereford beef cattle. “His philosophy was to use his wealth and his expertise (he was basically a well-read and self-taught animal scientist) to make improvements to cattle for the benefit of the common farmer,” Kruger says. Among his other agricultural endeavors, Penney funded an extensive horse and mule breeding operation on his birthplace farm in Missouri; he sought to improve 4-H organizations nationwide; and he donated money -- along with his herd of prize-winning Guernseys -- to create a dairy research center at the University of Missouri. Additionally, Penney applied his Golden Rule philosophy to personal farming partnerships he developed in his home state. He bought and improved farms; the tenant farmers provided the labor; and he split the profits among them. 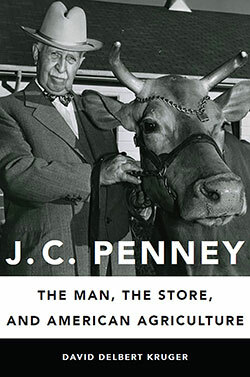 “Behind J.C. Penney’s homogeneous shopping mall façade lies a much deeper story about the company and the man who created it, a history innately tied to rural America and a Golden Rule spirit that is often lacking in the business world today,” Kruger says. In addition to researching historical archives for his book, Kruger interviewed more than 50 people, including Penney’s last surviving child, daughter Mary Frances Wagley, five of Penney’s grandchildren and former J.C. Penney CEO W.R. Howell. He also has written 12 academic articles on the history of the J.C. Penney Co. and its founder. The 360-page book, published by the University of Oklahoma Press, is available in hard cover or as an e-book. It can be purchased at www.oupress.com, from online retailers or at bookstores.